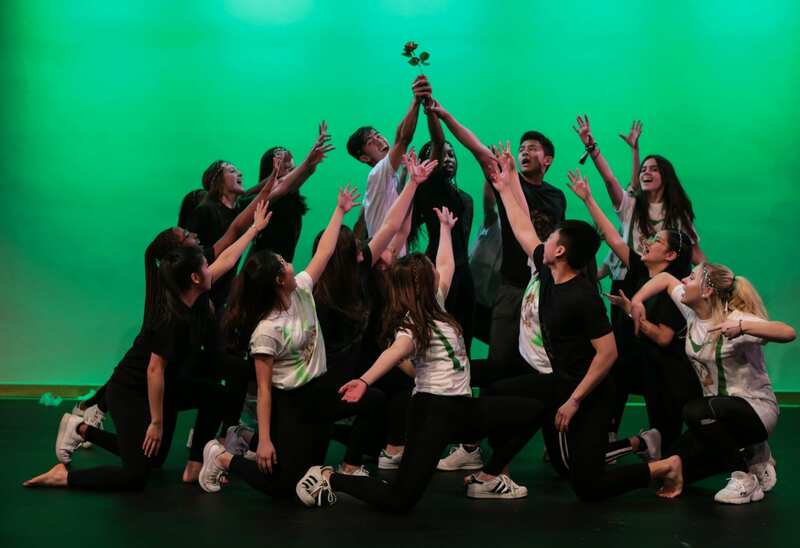 This year marked the tenth annual House Arts competition, and Concord witnessed talent, energy, creativity and enjoyment from students and staff. Concord’s four ‘houses’ (Gandhi, Mandela, Pankhurst and Teresa) competed in the Theatre on Saturday evening, to be crowned winners of the prestigious House Arts shield. With precious House-Trophy points on the line too, the competition was as eagerly anticipated as ever. The theme of this year’s event was ‘Courage’, and all four houses tailored their acts to reflect this through four categories: a dance, a song, an ensemble piece and a performance poem. With the theatre at capacity, Concord’s students rose to the occasion and competed against one another in a highly creative and entertaining show. Unfortunately, there could only be one winner on the night, but it deservedly went to Mandela House who performed admirably in all four categories. “Mandela were worthy winners” said Head of Pankhurst, Mrs Hattie Canney. “But a highlight for me was the Pankhurst dance. It was like a West End performance!” Concord’s Head of Mandela House, Mr Matt Rawlinson said: “The whole event was incredible and a new bar has been set. It was a night to remember. “Perhaps most enjoyable, for me personally, was seeing the Mandela House song grow from timid beginnings at the start of the week to an inferno of energy and positivity on Saturday night. “The transformation was remarkable and down to a combination of tremendous leadership and creativity from the Prefects, with the raw talent and hard work of the other students.” Mrs Canney added: “The Prefect dance at the end of the show was a fitting end to a fantastic night, and displayed the togetherness of the students in all houses. “It showed what Concord is all about… Despite being a competition, they were all in it together.” A huge well done and thank you to all staff and students involved in the planning, preparation and delivery of another outstanding House Arts spectacle. Thank you to this year’s judges: Concord’s Head of Art, Mr Anthony Hudson, local creative arts producer and director, Maggie Love, and Concord Music Tutor, Anthony Stevens. Overall finishing positions: 1st – Mandela 2nd – Pankhurst 3rd – Teresa 4th – Gandhi You can view the House Arts photo gallery by clicking here.